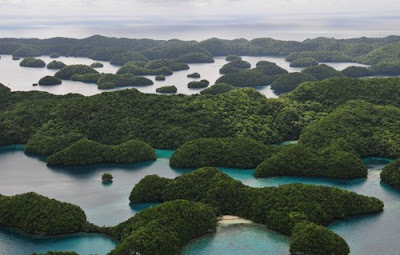 Pitbullshark: The Republic of Palau: Paradise or Adventure? This year, I think I have spent more time studying, figuring out, and planning my vacation than I will actually spend on the vacation. What an amazing, difficult, frustrating task it has been; nearly impossible, really. But I guess that's the story if you want to go off the beaten path. Oh how I wished it was as easy as my last trip somewhere (TWO summers ago), which was to Kauai. Regarding Kauai, I knew that I wanted to see the Na Pali coast from the sea by zodiac boat, and everything just fell into place from there. One search on Travelocity got me a non-stop flight to the Lihui airport, the hotel I wanted at about half the normal price, and a nice rental car. One click travelling! But, I don't know how many, millions, I guess, people go to Hawaii every year. The choice in flights, accommodations, anything you want, are legion. But this year, I wanted to go to a place I hadn't been to before, and that apparently NOT all that many OTHERS (comparatively) have been to before, either. Micronesia. I had read somewhere that even longed-for destinations like Fiji and Tahiti only have visitors that number in the thousands, so flights there really are just basically stop-overs on the long hauls back and forth between New Zealand or Australia, which are, themselves, pretty popular travel destinations. I have often wondered what it would take to make me ever go to Australia again, with its torturous 16-hour flight. I figured I have to be able to afford First Class, which I imagine I will NEVER be able to (or, when once faced with the difference in fares, I just never would spend the money). But, here, all of a sudden, I have booked myself on a flight (coach) that begins in Los Angeles at 12:40 PM on a Sunday and ends at 11:15 PM on a MONDAY. Well, that Monday is because of crossing the International Date line, so it's not really as bad as it sounds, but even so, from beginning to end, this flight consists of about 19 hours of travel time. I will be moving ahead across 16 different times zones! Originally, as I mentioned in my previous blog entry, I wanted to go to Ponape (my main goal was see the ancient ruins of Nan Madol), but I gave up on that. THOSE flights were on the order of 36 hours due to all the flight changes and stop-overs. A typical flight to Ponape (now called Pohnpei, but the airlines still call it Ponape) involved Los Angeles to Honolulu to Guam (with about a 16-hour lay-over) and then on to Truk (now known as Chuuk) and then, finally Ponape. Another choice might be Los Angeles to Honolulu to Majuro to Kwajalein to Kosrae and THEN Ponape, depending upon which way you wanted to cycle around the circle of the Continental Airlines Island Hopper (Continental was basically the only affordable airline going to those destinations). Travel reviewers routinely described this travel as the most grueling they had ever done anywhere in the world. I felt that to stop at all of those places, it might make sense to GO to all of them, let's say spend a couple of days in Honolulu, and maybe another couple of days in Guam, and Truk with their fantastic lagoon sounded like a place I wanted to see, so let's spend a day or two there, as well. All this was just too complex for the on-line flight systems (Travelocity, Expedia, Orbitz, etc.) because which way the flights go is based on what day it is. For example, once I began to study travel books about Micronesia, I decided I wanted to add Yap to the picture, but flights to Yap (in and then back out again) were only once a week, so if you wanted to see Yap for more than an hour, you had to stay there a whole week, which I did not want to do. I finally began to make some progress when I downloaded Continental's flight schedules and made a detailed spreadsheet of every place I wanted to go to (which by this time included yet another destination, Palau) and what days and times those destinations were served. But no on-line system could handle as many ins and outs as I wanted to do...Honolulu, Ponape, Truk, Yap, Palau, and Guam (Guam was essential for Yap and Palau, as Continental did not go to either of those two places except from Guam) and even Continental's own reservation system could only handle about half of them. So I fudged it a bit just to see what kind of cost was involved, cutting the various stop-overs in half, and that method revealed total ticket prices in the two, three, four, or five thousand dollar range, whereas the original LA to Ponape 36-hour "round trip" with all the stops cost about $1,800. Why the price became astronomical when one scheduled stop-overs at each of these places instead of booking a round-trip to one destination that involved the plane landing at all of them anyway, I can only explain as an idosyncracy of the on-line scheduling systems. Probably if I used a travel agent to schedule it all, or perhaps telephoned Continental airlines directly (instead of doing this on-line on their reservation system), I could get a reasonable deal. But by then I began to tire of the idea of all those different places and began to wonder if ANY of them were really worth it. I began to yearn to simply stay at home. But I couldn't get the idea of going to Micronesia out of my mind. I began to read a Micronesian travel guide much more carefully, and also got a video on travel to Micronesia, and decided that only Palau was really the place to go to. While the ruins of Nan Madol might be fascinating, as the ONLY reason to go to Ponape, they don't measure up as all that much. Yap really was a lot of trouble...the main reason to go there was that of all these islands, it was the one that most kept its ancient ways (meaning, it is the most primitive), but that carries with it a nuisance to the modern-day traveler, and that is to go almost anywhere on Yap, to each different village, you have to get permission from each different village chief. Also, Yap does have the curiosity of having a treasury of huge stone "coins" that are were once used for money (some of these can be have diameters taller than a man), but where those stone coins were originally made was in Palau (and part of what made them valuable was that they somehow had to be taken across the sea in a wooden canoe from Palau to Yap, so the difficulties and dangers of that added to their preciousness) and some of them are still there (as is the quarry where the stones were cut out of). Regarding Truk (Chuuk), the travel guide was forthright enough to say that except for those who come to Truk to dive in the deep lagoon to see the dozens of Japanese ships that were sunk by the Americans in World War II (which I was NOT going to go see), visitors don't like Truk, as it is somewhat an unsavory and possibly dangerous place. Apparently the people of "Chuuk", unlike most of Micronesia, are for some reason rather belligerent, which apparently has to do with all the bad economy and unemployment (which in Chuuk is close to 100%). Even in Palau, which maybe has the best economy of any place in Micronesia, most of the "economy" is charity from the United States (and the rest is whatever tourism they manage to have). Of course, the MAIN reason most people go to Micronesia is to scuba dive; Palau is supposed to be one of the primo dive spots in the world. But I will not be scuba diving as I have realized that it causes me anxiety that is greater than the beauty of it is worth (this maybe comes from my near-death experience scuba-diving at the Great Barrier Reef, even though I DID "get back on the horse that threw me" and went scuba diving afterwards in Fiji, but I think I have "done it" enough to suit me and snorkeling, instead, will do just fine!). To even read words such as "Blue Hole" or "Drop Off" or "Underwater Caves" or "Wreck Diving" or "A Hundred Feet Down", while inciting lust in a dedicated diver, almost sets me up for heart palpatations. 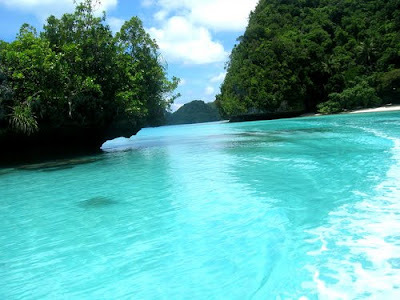 So, even though I am a certified scuba diver who has already been "a hundred feet down", and am going to a scuba diving place where most divers would give their life savings to get to go to, I will be enjoying the OTHER charms of the Republic of Palau. I have been saying "Micronesia" as if it were a unified place, but just as Melanesia and Polynesia consist of several different independent countries and territories, so does Micronesia, which was one of the difficulties in just figuring out the airline fights (since different countries have different economies and politics and thus different needs for and frequency of use of airline travel). All of the main islands of Continental's Island Hopper, for example, were in one country, called the Federated States of Micronesia (FSM), the main islands of which are Kosrae, Pohnpei, Chuuk, and Yap, which are states within this federation. Palau is a separate republic as are the Marshall Islands, Kiribati, and Nauru. There is also the Commonwealth of the Marianas. And Guam is a territory of the United States. One thing that interests me about all of these islands is that they are more or less on the equator, and while I have CROSSED the equator before, I had never gone to anywhere ON the equator before. And, I believe, hurricanes do not occur on the equator, but they do START from there and cause their damage elsewhere. So, tropical islands that do not get periodically damaged by hurricanes (such as what happens to Hawaii) is a pretty interesting concept. However, these islands suffered greatly during the Japanese invasions prior to World War II and the American efforts to destroy Japanese naval bases, thus all the sunken wreckage everywhere. One of the islands (Bikini, in the Marshall Islands) is where the United States did atom bomb testing. But throughout it all, the people of these "micro" islands seem to have managed to keep their cultures and identity intact. Now that I knew enough about flight schedules and the like, I was able to do a simple "round trip Los Angeles/Palau" search (which, by the way, is actually a Los Angles/KOROR" search, as Koror is the main island in Palau that people go to, whereas a "Palau" search gets confused with a location in Sardinia of all places!) and lo and behold a somewhat acceptable flight on DELTA was discovered by ORBITZ that cost (what looked by now as) a "reasonable" $1,600. Travelocity and Expedia had nothing even close, so Orbitz is this year's winner and I booked through them the flight they discovered. The flight goes from Los Angeles to Tokyo, and then after a short layover, a plane goes from Tokyo to Koror. The return flight isn't QUITE as good, as there is a longer lay-over in Tokyo this time, not long enough to really do anything, but too long to just stay in the airport the whole time, so it looks like I might dare to venture out into Tokyo proper a little bit. Asia is a big hole in my travel experience, in that I have never been there, I've always considered it something rather difficult to deal with (although I guess it isn't really) due to Asia having languages that aren't easily deciphered in a phrase book. Just to be on the safe side, though, I think I will have to bring SOMETHING that deals with English/Japanese, which I may very well need even in Palau, as tourism there is heavily loaded for the Japanese, as well as the Chinese. Several of the hotels in Koror I have investigated on-line are described as "primarily for Chinese businessmen" (those would be the downtown, business district hotels), whereas several of the resorts cater to the Japanese and their websites are even IN Japanese, not English. One of the most beautiful resorts is owned by Japan Airlines. Despite their website being entirely in Japanese, based on their photos, that's the place I would have loved to have stayed, but it was the second most expensive resort in Palau and way beyond anything I would pay. The Japanese are apparently really into scuba-diving. But now here I am with a booked and paid-for flight, but I have no idea where I will end up staying. That has been another frustrating experience. Things are quite a bit more expensive there than I would have expected, especially if the place is nice or has lots of amenities (and by that I mean "balcony", "swimming pool", and, preferably, a beach...this IS a vacation to a tropical paradise, after all). But $400 or $500 a night is not something I will do...even $250 a night is not something I will do, and that price is getting down to "mid-range". In the hundreds, say $150, generally means "just a room", not a pool, and certainly not a beach, and even that is, to me, "freak out expensive" when multiplied by nearly a week's worth of nights. Orbitz, that was so helpful in finding my flight, would only come up with two hotel possibilities, neither of which appealed to me, but after checking out several other hotel-booking sites, I realized that very few of the available hotels were even checked by any of them at all. The best source of hotels was Palau's travel board site, that was fantastic for providing information about nearly everything--tours, museums, shops, restaurants, and every level of hotel, guest cottage, bed and breakfast, resort, motel, and condo rental. So I am sure that I will come up with SOMETHING, although it may end up being a far cry from what I have been hoping for. Which may end up being a run-down Asian version of a Motel 6 (which would be positively luxurious in comparison). Oh, there IS one other possibility, kind of crappy, but maybe kind of cool too...kind of way far out on the end of one of the islands still connected by bridges or roads, but where the roads are dirt and the rental car companies won't let you rent a car if you are going there, but will rent you a jeep or four-wheel-drive, instead, are what are called "ocean-side bungalows" that are individual cabins costing somewhere between $40 a night and $100 a night. They're described as being several hour's drive away from everything anybody wants to do when they come to Palau (off the tourist track), and are "too poor" to have much of a presence on-line, but if they are on the beach and they put a roof over your head and have bathrooms, how bad can they be? This may be kind of like camping, but with rustic cabins. They may actually be a secret paradise if only one would be brave enough to take a chance (would anybody complain about staying at Curry Village in Yosemite, for example? No, I don't think they would, unless they wanted to spring hundreds and hundreds for the Ahwanee Hotel). I don't know though, I just wish I could get better information (or better photographs) about them. I am spending too much money just flying to Palau to have my trip ruined by horrible accommodations. But I guess I wanted to have an adventure and this might be it. We'll just have to see how things shake out in the next few days.